Multi-Vital 28/13 is a complete food maintenance for adult dogs. In its composition incorporates rice and lamb as a source of animal protein, which makes it highly recommended for dogs with sensitive digestive and for the care of the hair and the skin. Arion Lamb & Rice Multi-Vital 28/13 is a complete food maintenance for adult dogs. In its composition incorporates rice and lamb as a source of animal protein, which makes it highly recommended for dogs with sensitive digestive and for the care of the hair and the skin. Very appetizing and attractive, with formatting multipartícula with eight croquettes different. Ingredients: vegetable products, meat and meat products of meat (14% lamb cutlets brown), cereals (14% rice in the croquette brown), oils and fats, extracts of vegetable proteins, minerals, yeasts, eggs and egg products, fish and fish derivatives. 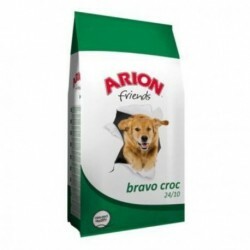 Description: Arion Friends Lamb & RiceArion Lamb & Rice Multi-Vital 28/13 is a complete food maintenance for adult dogs. In its composition incorporates rice and lamb as a source of animal protein, which makes it highly recommended for dogs with sensitive digestive and for the care of the hair and the skin. Arion Friends JuniorArion junior 30/14 is a complete food for puppies of all breeds. Is designed to achieve a harmonious development of the puppies from 2 months to 12 or 18 months of life, depending on the race.